Lie another towel on your counter and cover with a generous amount of flour, wheat bran or fine cornmeal and then place the dough on it, seam-side down. Be sure the flour extends beyond the borders of the bread as it will be growing. The reason for the generous amount of flour is that you do NOT want the bread sticking to the towel when you go to invert it into a hot Dutch oven. 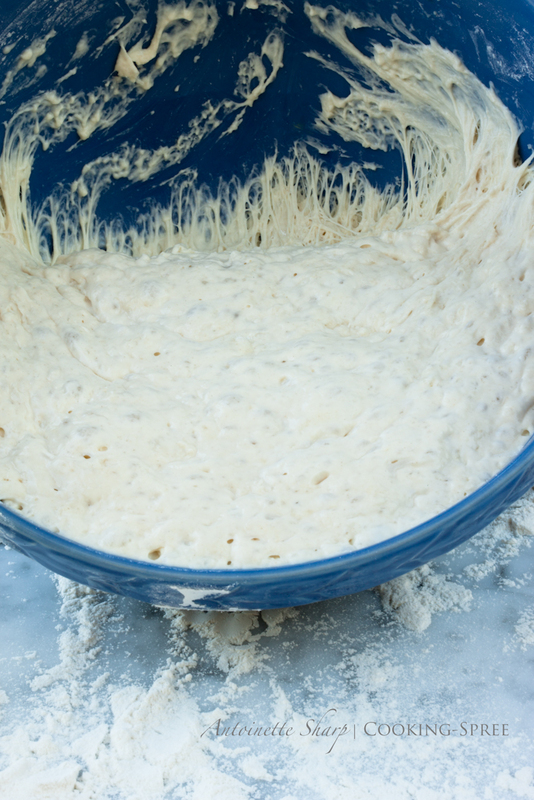 Dust the dough with a little more flour then cover with a tea towel and allow to rise about 2 hours. In these two hours the bread will have more than doubled its size. About half an hour before the dough is ready, place a 5½ to 7½ quart Dutch oven with its lid into the cool oven, and then preheat to 450ºF (230°C.) When the dough is ready, remove the Dutch oven from the oven, and place it on a hot pad or trivet. Carrying the risen dough IN the towel, with your hand underneath, carefully invert the loaf and drop it into the Dutch oven. The seam will now be on top. It won’t look terribly pretty at this point, but not to worry a bit! Give the Dutch oven a gentle shake to help settle the bread more evenly, then return the lid to the pot and return all to the oven. Bake for 30 minutes with the lid on. Remove the lid and bake for another 15 to 30 minutes. (Time will depend on whether you’ve placed your loaf in a larger or smaller Dutch oven. The smaller will give you a higher loaf and require a bit more time to cook.) The loaf will be nicely browned when done and the internal temperature will be 200-210°F (93° to 99°C.) Remove from the Dutch oven and allow the bread to cool (completely if you can, so as not to disturb the environment inside.) Bon appetit and full delight! I want you to know that when I inverted this loaf into the Dutch oven, the dough stuck to the towel it was on. Yes, not enough flour (the very thing I warned you about.) I had to tug on the dough where it was stuck, breaking bits of it with my fingers, before it finally landed upside down in its pot. Did it hurt it? Oh, a little. Not quite as tall, not quite as pretty, and it didn’t break open at the top like it normally does. But will we eat it, and will we love it? Oh my, will we! The reason I point this out is that you really can’t mess this bread up unless you’re trying hard to. And why would you go and do a thing like that? I’ll likely make another loaf in a few days and insert a photo of it looking its gorgeous best. 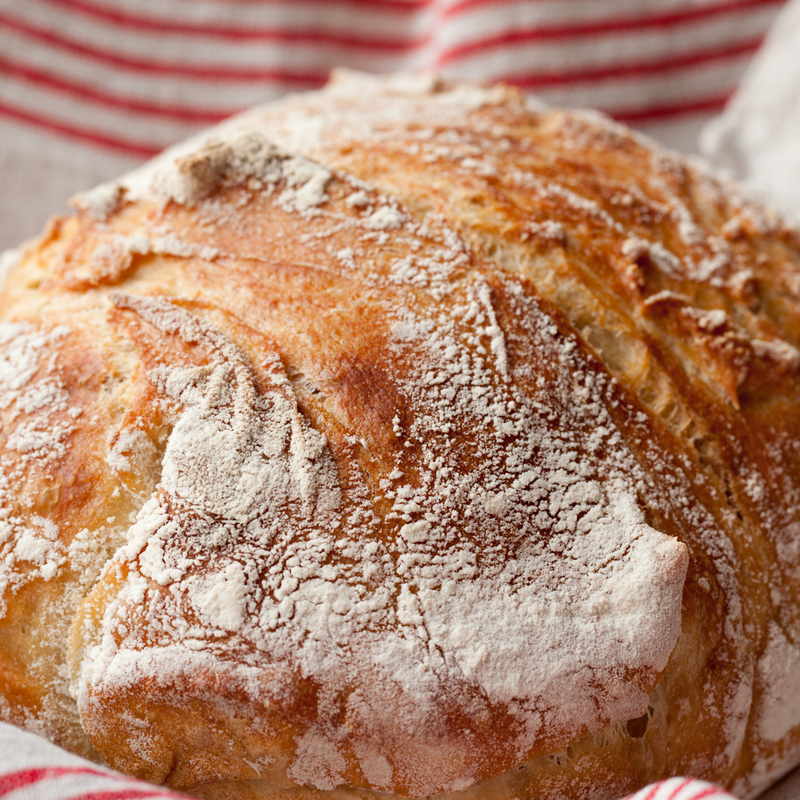 We can attest: such delicious, crusty bread with thorough and easy to follow directions. We’ve used them many times with amazing results. Our family devours this bread! That bread looks delicious! I’m definitely going to try this recipe. How wonderful. And just in time for real winter weather. 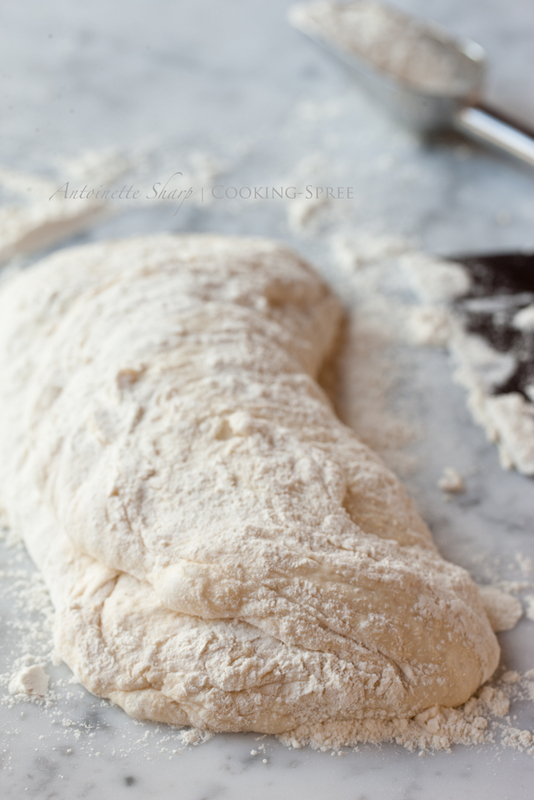 Have you ever tried to make this bread with whole grain flour? Ronnie, I have – about 3/4 cup whole wheat to 2-1/4 cups unbleached a-p flour works great. Any more than that though and texture and density of the bread suffers.. 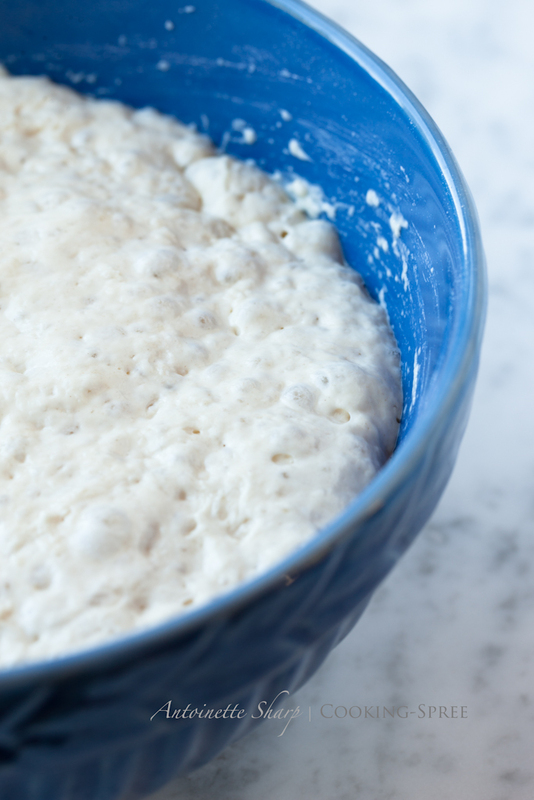 I haven’t experimented with this but I understand that a certain amount of sourdough starter added in will create an environment more suitable for higher proportions of w/w flour. I’ve seen articles on it and if you’re looking for higher w/w content, I bet you could find some good information out there. 🙂 good luck! Let me know if you try something good! I have also made this bread again and again (though not too recently) and can attest to its greatness. Your pictures are lovely, and make me want to bake some again soon! Oh I’m happy to have you reminded you! Making bread is on my list of things to learn to do in 2012! Thanks for the inspiration. How fantastic – will start it tonight for baking tomorrow! I do hope you’ll let me know how it goes! This bread dipped in your Arbequina olive oil would be just this side of heaven! Your instructions and pics here are great! 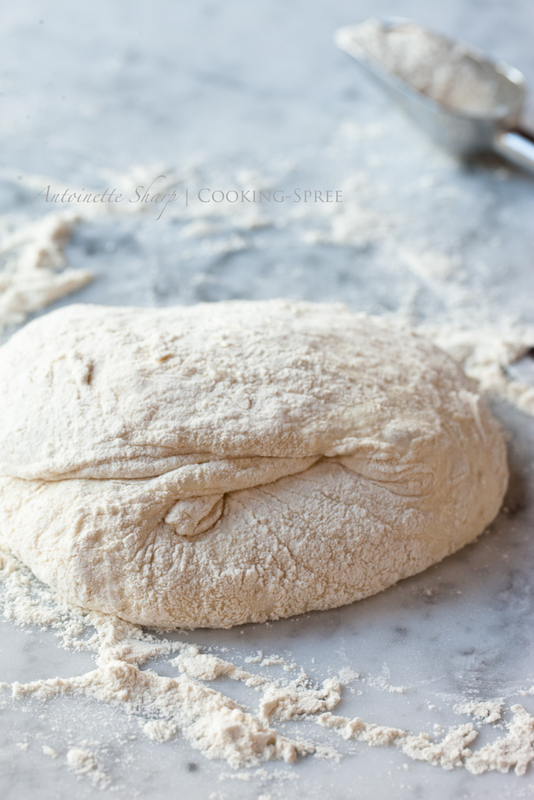 I have a very similar no-knead bread recipe and it makes a fantastic tasting loaf of bread. I’ve friends who can’t get enough of it. Thanks John…and I’m running to your site now to see if you’ve shared yours yet! Would love to see it! Looks fantastic! Your pictures are just wonderful too. 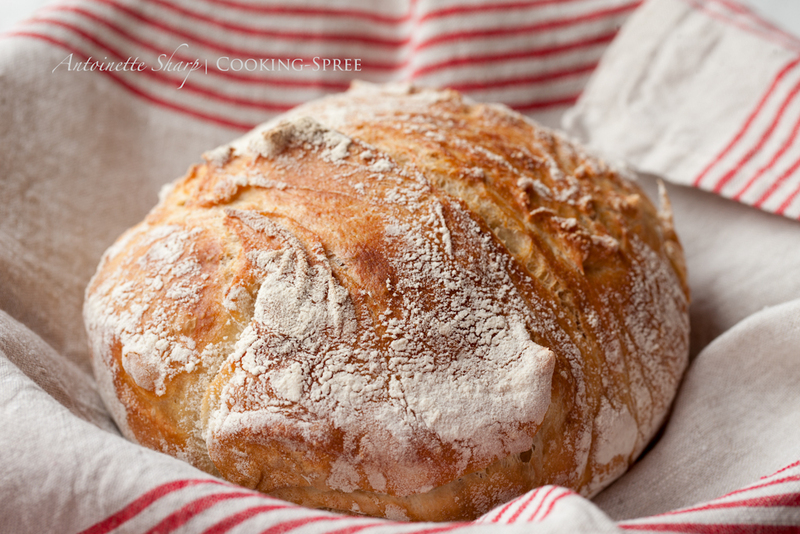 You can’t seriously think there’s a need (knead) to improve on this loaf, “perfect” or not! What a beauty. Wish I could safely do flour-based stuff here, but alas, I’m learning that’s not to be anymore. So I’m extra glad when a real kitchen artist like you posts this kind of spectacular beauty so well that I can “smell” it from here, at a safe distance!! Love it. Short note on my way to the kitchen; this looks like such fun, I’m starting it tonight- with still a half loaf of the previous blog’s bread on the sideboard! Sharing or “breaking bread” is always good. Love it! Have fun and let me know how it goes! I’m completely intrigued by this recipe and can hardly wait to make. I’m getting ready to move, and keep picturing myself in the new house, with this bread rising on the counter. Some extra motivation for the packing! I like to bake bread, but a wrist injury prevents me from kneading much. I have a breadmaker, but just not as satisfying as a truly hand-crafted bread, both in method and product. This no-knead option looks like an excellent alternative for me. Not to mention, the bread looks beautiful and I’m sure it’s delicious! Moving is Never fun, so I like your strategy of setting something out there (in your mind) to get you more happily to your next home! As to your comment about bread-makers – no, they just don’t satisfy in nearly the same way. Something very lovely is lost in the short-cut. (And taste is only part of it.) I think you’ll really enjoy this bread! Best of luck with your move! …been in the oven for only 10 minutes now, and our house smells better than anything this side of heaven! No, not much better, and I ogled and drooled over your own gorgeous loaves just the other day! I loved this recipe! It came out great with a wonderful flavor. Thing is, I’d now like a bigger loaf, Could I double the recipe? I have a second dutch oven, and could do 2 loaves at a time that way, if necessary. But it’d sure be easier to do one, bigger loaf. My dutch oven holds 4 quarts of water with still an inch to go to the rim. I’m thinking the answer would be “Yes” but if you have time I’d appreciate your input? Don, I haven’t tried increasing the size of the loaf, so here’s the best answer I’ve got (and not as lazy as gee I don’t know, which is also true) : I’d try first with 1-1/2 times-ing ithe recipe. see what you get from that, and go from there. Keep in mind that you’ll want to bake a bit longer in order to get a larger loaf done inside – if you have an instant-read thermometer, go for the 200 to 210F reading – I’m guessing that will take a good 15 minutes longer? You might try baking a bit longer with lid on so as to prevent over-browsing of the loaf during lid-off stage. Hope that’s helpful. Just wanted to let you know that I made this beautiful bread this weekend. It was the first thing I baked in my new kitchen, and what a way to start. The loaf is beautiful and tasty, and my fella just can’t stop raving about the crust! Remarkably easy to make, too. I’ll be baking many more of these, for sure. Thank you again for sharing! It’s always the most gratifying thing to hear back from someone who’s tried what we food bloggers post. Thank you so much for taking the time to do that! And I’m very happy to hear you & your fella liked it so much! I read this this morning (it’s now 7pm) and I have been thinking about it all day. Right. I’m doing it. NOW. I’ll let you know how it goes. Thanks for the recipe! hmmmmm…….love this and I love your blog too. Thank you so much Kate! We’ve been away and I’m only just now seeing your sweet comment!